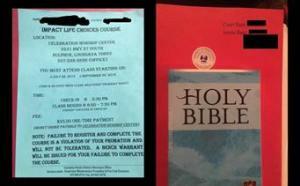 A municipal court judge in Louisiana with an apparently limited understanding of the US Constitution is forcing first-time drug offenders seeking probation to attend a Christian program called "Life Choices" offered by a local church. The First Amendment's Establishment clause mandates that the government cannot in any way promote, advance, or otherwise endorse any religion, a principle well-established in federal jurisprudence. That bright dividing line between church and state also applies to court orders and terms of probation that require participation in religious programs, as can be seen in a line of cases decided in federal appeals courts over the past 20 years. The fundamental principle behind Establishment cause jurisprudence is, as noted in Lee v. Weisman (1992), that government must remain neutral toward religion because "the preservation and transmission of religious beliefs and worship is a responsibility and a choice committed to the private sphere." Not in the court of Sulphur City Court Judge Charles Schrumpf, though. As the Freedom From Religion Foundation noted in a July 20 complaint letter to Schrump and probation officer Barbarba Adam, Schrump's way of handling those cases is completely unconstitutional. Probationers in the program receive a Bible and have to complete homework that involves reading passages from scripture, as well as from the evangelical text "Made to Crave." According to the letter, probationers who objected to participating in the Life Choices program because of its religious content have been told by Probation Officer Adam to "take it up with the judge" in a threatening tone and warned that failure to complete the program would result in the revocation of their probation. According to the blog Friendly Atheist, which spoke with a person ordered to take the course, the course teacher said that while attendees weren't required to be Christian, that was the ultimate goal, and Probation Officer Adams responded to an attendee who said he was an atheist by saying, "We'll see how you feel after eight weeks [of class]." The foundation is demanding that the practice be ended and that if the court is going to impose drug treatment or counseling as a condition of probation, it does so through programs that are "medical and secular, not religious in nature." At this point, the foundation is not threatening a lawsuit; only seeking notification "of the appropriate actions taken by the Court and the Probation Office to protect the right of conscience of probationers in their care." There is no word yet on whether Judge Schrumpf will heed the foundation's complaint and restore the Constitution in his court or whether he will double down in defiance. In the meantime, if you get caught with drugs in Sulphur Springs, may God help you. Thank you for this incisive reporting Drug War Chronicle. If the state is going to make someone submit to a religion it could at least be the superior Islam. How do mo-orons like this judge achieve positions of power and respect? But I've answered that elsewhere. It's the defining character trait of the United States's non citizen. Placeholders allowed only. Shared on FB and Twitter. I haven't had a drink or a hard drug since January 7th 1976. I spent about 5 years working in D&A treatment including a detox for winos and junkees and an extended rehab for poor little rich kids. My observations of religious efforts at rehabilitation revealed nothing but disaster. Statements like 'if you believe in Geezus you won't drink alcoholicly' and 'prayer is the answer' caused more relapses than successes. The more modern and enlightened Christians serve grape juice instead of wine for communion. Transubstantiation, according to dogma, only changes wine into blood if you have perfect faith. Unfotunately most religious rehabs are run by the less enlightened. My experience with the courts is that they often attempt to treat Alcoholics Anonymous as a government funded social service that has to obey them. Educating our judicial system would have much more poitive results then court ordered rehabilitation from the religious or the for profit Rehab Racket. Yeah, use Christrianity as a punishment. That's what Christ would have done isn't it? I don't think we can hold his stupid followers against him.